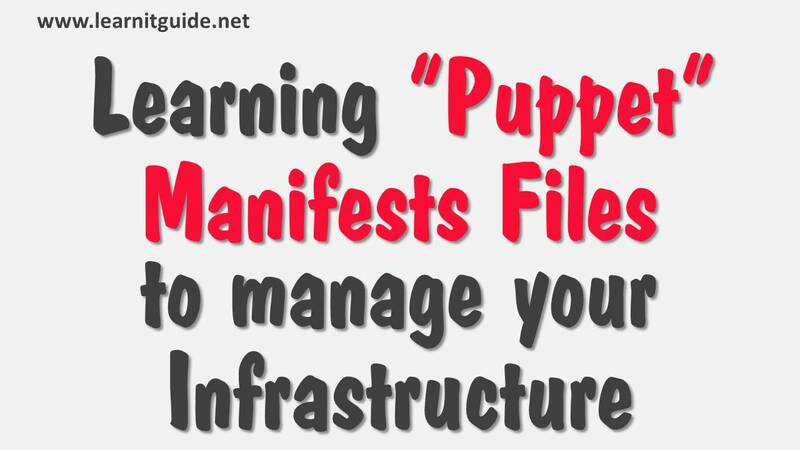 In this article, we will describe you how to use and write Puppet Manifest files and manifest Syntax to understand how to manage your complete Infrastructure servers. Manifests are files with extension ".pp" will be created at the puppet master end, where we declare all the resource types to be managed. Resources might be files, packages, services and so on. To know more, refer this puppet fundamentals about manifests. Lets take an example scenario that, we have 1000+ servers which are connected with our puppet master server. We have requirement to do some operation changes to manage your all 1000+ servers. 1. Modifying the file /etc/motd in all infrastructure servers to add a content using puppet automation. 2. Stopping Postfix service in all servers. In all servers, we have already installed puppet agents and connected with puppet master. Refer this to link to install puppet master and puppet agents. Now what are actions we perform in order to do these requirements in a single server if we dont have any automation softwares not implemented like puppet. Mainly we do these below actions for these resources file /etc/hosts and service postfix. 2. If present, then we will do the required changes. 3. If need, We will change file permissions. 1. We will ensure whether the service exists or not. 3. If running, stop it. This is what our requirement. Lets do these actions by writing in the puppet manifest files. This is how we can write the manifest files to manage our complete infrastructure servers. Note : In the first line, we have defined to apply the changes for all default nodes which are connected to puppet master server. If you want to do these changes for one server, change as "node linuxdb1.learnitguide.net". So changes will apply only to the particular puppet agent node. By default, Puppet agents will give request to puppet master to check any changes for every 30mins interval or manually run the below command on one server to test. Thats all about use and write puppet manifests files to manage our infrastructure servers.